Looks good mate what handle are you putting on it ?? ocd i like that , i like it mate take your time on this one it could be a show stopper , gret shape you should draw round it keep it as a stencil , i might be able to get you some laser cut one day . even if not you can refine it over the years and it will be your own knife to your design . the file work looks great to well done . no mate its aby-b's design that one ! got a good look to it i reckon . 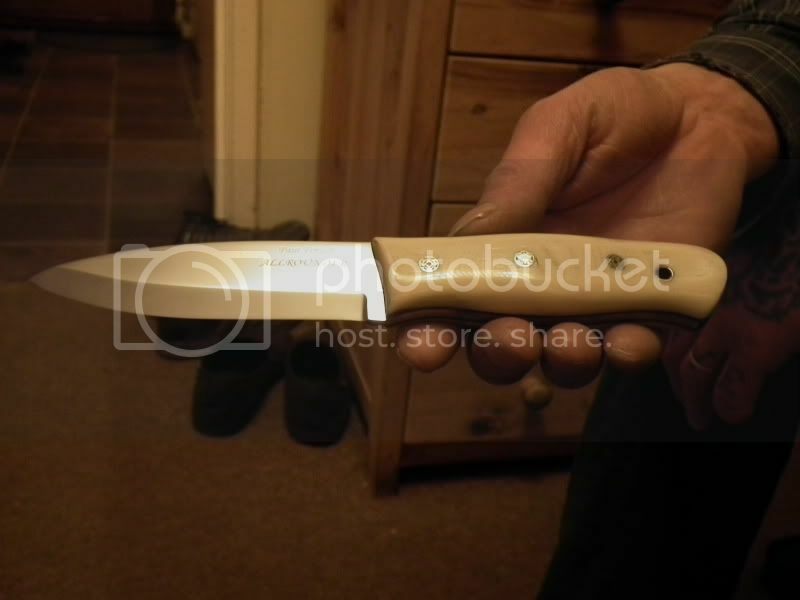 as for handle material .................... got a modern look with a clasic line , brass bolsters and pummel with a ivory alternative micarta in the midle , would look realy classy maybe a 1mm brass liner to bring out the file work and contrast the filler ? Like the look of that Gin. What is the micarta like to work with ie. cutting and sanding/finishing? agreed i love it and its my fav material its trusted for its workability and finnish and it is super hard wearing . i really like that knife dave its very nice !! well that looks great me and the mrs are both saying how well it looks and that you have done well !! the bolster holes look spot on !! this one is gonna be nice i think !!! would love to see this when its finished. Really balanced look to it.